AT&T has announced that their first LTE/HSPA+ devices will arrive online and in stores on August 21. 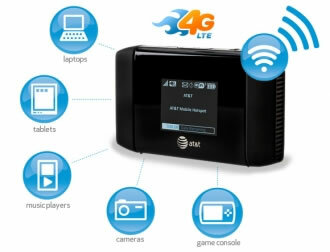 Two connectivity devices are slated for release on Sunday, the USBConnect Momentum 4G and the AT&T Mobile Hotspot Elevate 4G. Users hoping for 4G phones or tablets will have to wait as AT&T is only introducing USB modems initially. This is a smart move on the provider’s part since their LTE infrastructure is brand new and the company would likely rather ease customers onto the network rather than flood it with traffic. Both of the new devices will be compatible with AT&T’s 4G LTE network but will fall back to slower HSPA+ speeds should you enter an area not covered by 4G. The USBConnect Momentum 4G will be available for $49.99 with a two-year service agreement after a $50 mail-in rebate. The Mobile Hotspot Elevate 4G comes in at $69.99 with a two-year contract after a $40 mail-in rebate. Customers will be required to sign up for a $50 monthly service that provides five gigabytes of data. Overages are billed at $10 for each additional gigabyte used. If you already own a USBConnect Adrenaline dongle, you can visit AT&T’s Adrenaline page starting August 26 to download a firmware update to enable LTE on this device. AT&T is rolling out 4G LTE service in five markets this summer: Atlanta, Chicago, Dallas, Houston and San Antonio. The company plans to add 10 additional markets by the end of the year, covering 70 million Americans as 2012 arrives.